Answer: The short answer is yes, we could learn from them — or they could learn from us. As with your question last week, it all comes down to how good both of us are at anticryptography. Astronomers, philosophers, mathematicians, and linguists have long pondered how such learning could happen. Detection of our signal (see top graphic). Recognition of non-random content and intelligent source. Attempt to decode the message and extract meaning. Raster graphic protocol would be recognized. Extraction of clues about encoding, syntax, and mathematical conventions. The beginnings of a language. Give them some time to decode the message and respond. Meanwhile, start (and continue) listening. One disclaimer before continuing — we’re talking about radio communication here. Thus, for even the closest extra-solar planets, there would be over 8 years between our transmission and their answer (assuming they answered immediately). Conversation in its normal sense would be impossible. This would be a time-consuming process. So to go beyond a simple announcement of our presence, and to start a real conversation, we’ll need to build a vocabulary based on mathematics. The graphic at top is my attempt to craft such a message. It was a fun exercise. 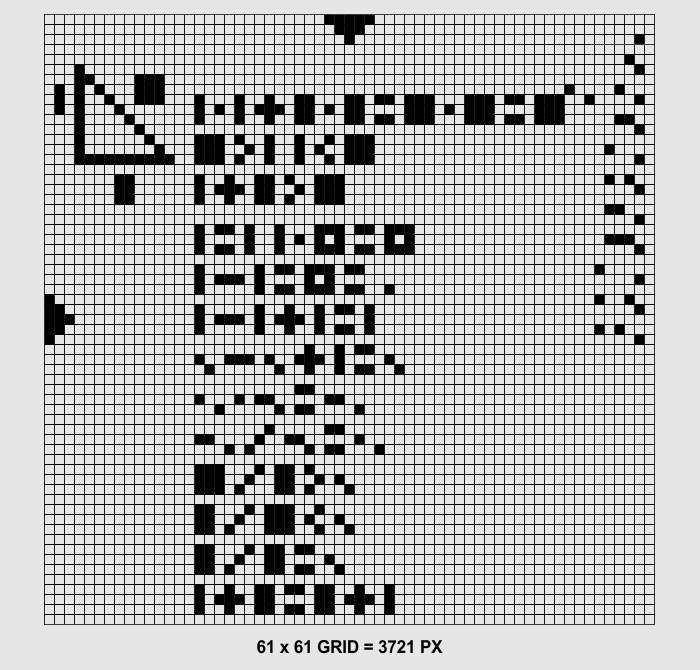 The Arecibo message was a mere 73 x 23 raster graphic. I chose to increase the “resolution” by using a 61 x 61 pixel grid. That gives me enough real estate to create a 3 x 3 pixel symbol set, which is all we need right now. Once the protocol is established, the resolution can be increased indefinitely — up to photographic level if needed. You could get HD (1920 x 1080) by encoding your graphic as the product of primes 1931 and 1087. That would be a 2,098,997 bit signal. My graphic is 3721 pixels, the square of the prime number 61. I debated about adding those down and right arrows on the margins (to indicate the top-down left-right flow of information), but the pixels were available so I included them. They may be superfluous, though, since I’m sure all rotations and reflections would be examined for meaning. This message is an attempt to build a mutual vocabulary starting with mathematics. Later the conversation would extend to physics. At that point practical information could be exchanged. This would be easier than you might imagine. Learning about music, art, philosophy, and culture would be far more difficult. So let me explain what my message means. SPOILER ALERT: If you want to try decoding it yourself (instead of working the morning crossword) read no further. At far left is a right triangle. It’s sides are labeled with generic symbols. At far right is a vertical column of binary digits, with 0 at the top and 10 at the bottom. Each binary number has a place-holder diagonally to the right below it to indicate where to start counting powers of 2. I could have gone higher but stopped at 10. That number is a clue to the “traditional” counting system used on Earth, which was based on the number of human digits. And to establish the binary counting pattern, 10 numbers more than suffice. The first of 13 rows of symbols is a pictographic representation of the Pythagorean Theorem. This would be a known law of mathematics anywhere in the cosmos. There’s the start of real communication. Note that none of these 13 rows can stand on its own and be decoded. Each must be looked at in context with the others. If my composition is clever enough, there’s a unique decoding that conveys real meaning. As you progress down the 13 rows of symbols you’ll see a mix of pictograms and binary numbers. This is done to provide a “Rosetta Stone” for our language. In each row you can see identities, properties, and definitions. Note the fourth row contains two equations, separated by two spaces, to establish the “break” convention used elsewhere. So what we have in our mutual vocabulary at this point are some important concepts and symbols for mathematics: “=”, “>”, “<“, the four basic arithmetic operations, some identities, the commutative property (last line), exponential notation, and the binary counting system. We’ve also given a hint that the number 10 is important to us. Our message need not stop at 61 pixels height. It can scroll on as far as we want (as long as the height is a prime number). My message stopped at the commutative property. We could go much further. The main idea is to start with the basics and work our way up the vocabulary. How far we can climb is anyone’s guess. But after a sufficient number of exchanges, we should be ready to progress to physics. That’s when it could really get interesting.